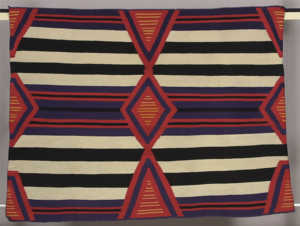 Greenwich, CT - On August 18, 2018, the Bruce Museum will open A Continuous Thread: Navajo Weaving Traditions. This exhibition will trace the history of the Navajo weaving tradition from the earliest Mexican-inspired Saltillo serapes, c. 1880, to mid-20th century pictorial rugs. Featuring a dozen items from the Museum’s Native American ethnographic collection – some of which have never been publicly exhibited – the exhibition will be on display in the Bantle Lecture Gallery through November 25, 2018. Navajo rugs are unique because their warp (the vertical strings on a loom) is one, long continuous piece of wool thread. Once the warp is set on the loom, the size of the rug cannot be altered. This weaving method requires the weaver to plan the design and pattern of the rug to fit precisely into the predetermined length of the rug. The items on display are from the collection of Miss Margaret Cranford (1887 – 1974), a resident of Greenwich. At the age of 21, Miss Cranford began a lifelong pursuit of traveling across the United States and the world, collecting fine decorative art, jewelry, and textiles.